Since the seventh grade, Dr. T.J. knew he wanted to be a chiropractor. The first time he encountered the natural healing profession, he had an injury while playing hockey and sought the help of a chiropractor. “I was fascinated by how good I instantly felt. Since then, I’ve learned that while being pain-free is great, chiropractic care has much more to offer than getting people out of pain.” He’s been active in sports including college football and occasional weekend warrior games and still enjoys the benefits of regular chiropractic care. 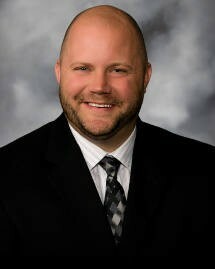 Dr. T.J. is originally from Groton, South Dakota, and graduated from Groton High School in 2001. He then enrolled at Northern State University, majoring in biology. The next step was chiropractic college at Northwestern Health Sciences University in Bloomington, Minnesota. He obtained a Doctor of Chiropractic in 2009 and then opened Living Life Chiropractic. Get started on improving your life — schedule your appointment with Dr. T.J. today! Insurance coverage is accepted at our practice.